Has the weather been keeping you from flying? Just want something fun to do on a Friday night? There will be indoor flying through the end of April thanks to Ron Lawson. There is a solution close to home. We fly Friday nights 6-9pm indoors at the Central Baptist Church (601 N Central Ave, Eureka, MO 63025). All are welcome to fly for $5 a night, but must be a current AMA member. It’s a great way to brush up on your flying skills, not weather dependent, and Fun!! weather been keeping you from flying? Just want something fun to do on a Friday night? 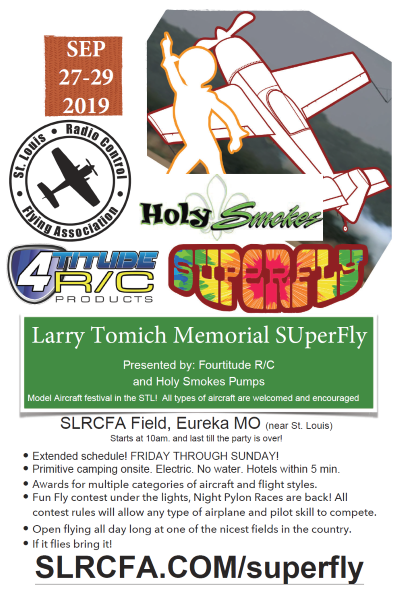 There is a solution close to home.Many SLRCFA members have been flying Friday nights 6-9pm indoors at the Central Baptist Church (601 N Central Ave, Eureka, MO 63025). All are welcome to fly for $5 a night, but must be a current AMA member. It’s a great way to brush up on your flying skills, not weather dependent, and Fun!! 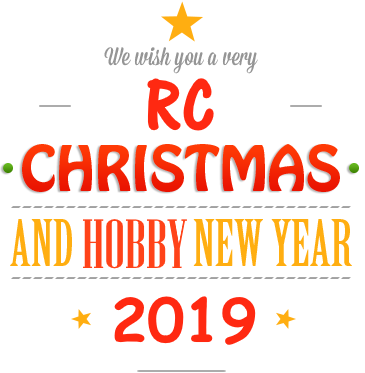 LEARN TO FLY RC IN 2019! If you want to learn to fly RC without the expensive investment in equipment, look no further than the QuickSTART Program from SLRCFA. 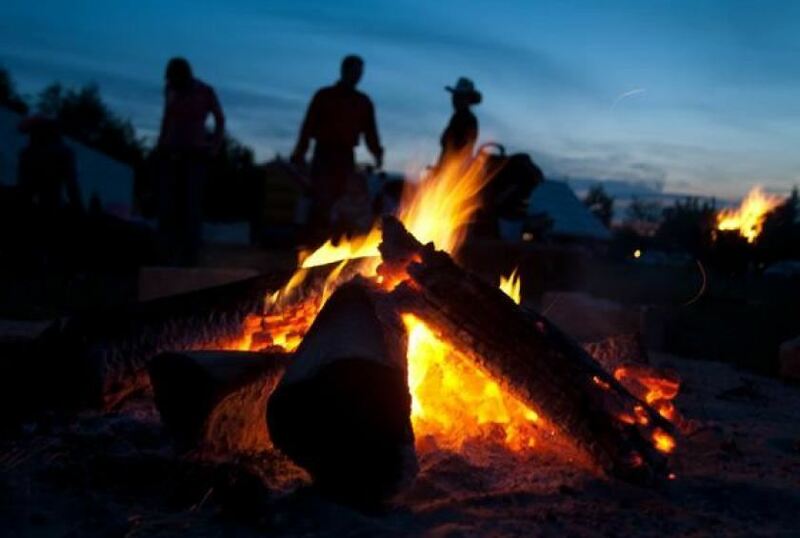 We'll meet every Tuesday night, weather permitting, starting in April until it get's too cold in the late fall. It's a blast!!! Instructor - you will be assigned a INSTRUCTOR immediately upon verification of membership. Once you solo, you can fly with your instructor. Contact & Scheduling: You'll have your Instructor's contact info and can meet at the field for Instruction (Tuesday nights, typically). Winter "flying" - QuickSTART members meet on various Tuesday nights for simulator flights and ground school on a big screen. Length of membership: Up to one year, expiring December 31. You must renew by January 1 at a different level to maintain membership the following year. If you can help us teach new QuickSTARTS, we need the help! We added 25 new QuickSTARTS in 2017 & 2018, and we're expecting 20 more in 2019. Contact 636-429-2884 to help us help these new folks getting into the hobby! All members are welcome at the Board Meetings. Just an FYI... many folks will be attending Joe Nall Week in South Carolina at the Triple Tree Aerodrome. Larry Anderson is bringing his collection of antique RC radios from the early days of the hobby. Some of the technology to get our planes in the air back then (50s and 60s) is hard to believe. We're talking Eisenhower administration radios! We're talking TUBES!!! We will be at the SLRCFA Field for this meeting. Dogs, chips and cold drinks will be there, too! We gotta come together and get the field in shape for our guests. Field Team missed our opportunity for the Field Opening Work Day in April due to terrible weather, as you probably recall. Lots to be done, so please come on down and help! Come on out and we'll fly after we're done (FIELD CLOSED WHILE WORK IN PROGRESS). with a CombatONE & BBQ Chaser! 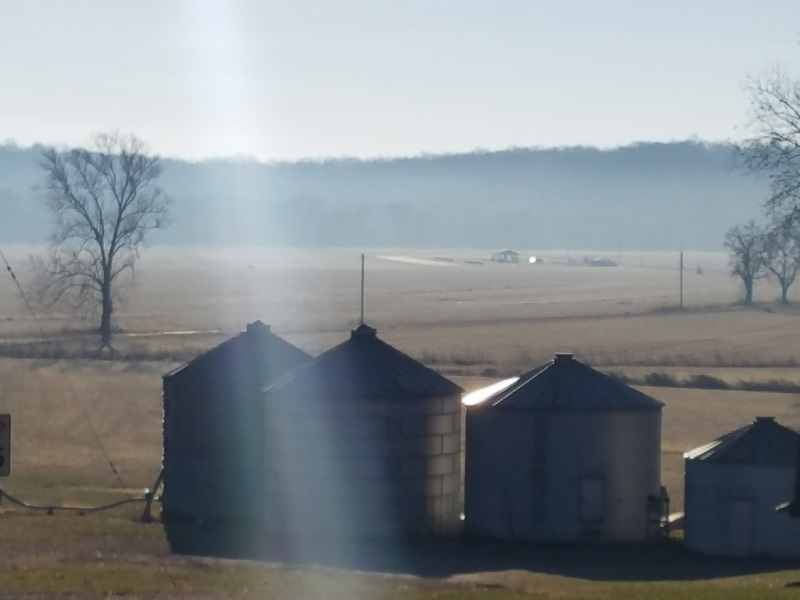 We be campin' and we be flyin'.Nothings more beautiful than SLRCFA field in Spring with planes in the air at dusk or in the morning, so we're putting them both together. Come out Saturday and fly. Come out Sunday morning and fly. If you choose, pitch at tent or camper and stay over night! Be our guest and fly even if you're not an SLRCFA member. Just bring your AMA card and you're good-to-go. Coffee and donuts Sunday morning. Bring out the CombatONEs a day of pulling Gs and pulling pork. We'll be barbecuing and driving through each other's streamers. Regular flying permitted all day. Combat will be performed in intervals so everyone can fly. Thanks or being part of the best RC club in the Midwest! During the flying months, we don't mess with club meetings unless we need to call one for a special reason. If you have any questions, don't hesitate to contact the board at 636-429-2884. We be campin' and we be flyin'.Plus, shootin' off fireworks. Nothings more beautiful than SLRCFA field in July with planes in the air at dusk or in the morning, so we're putting them both together. Come out Saturday and fly. Come out Sunday morning and fly. If you choose, pitch at tent or camper and stay over night! If you stick around, we'll shoot some fireworks with you. PLEASE REGISTER EVEN THOUGH EVENT IS FREE SO WE HAVE AN IDEA OF HOW MUCH FOOD TO PURCHASE. THANKS! Be our guest to fly even if you're not an SLRCFA member. Fly from the 5th through the 8th. Just bring your AMA card and you're good-to-go. SLRCFA has the right to refuse admittance with cause. We'll burn something good on Saturday. National Model Aviation Day | CombatONE Burgers & MAYHEM! It's NATIONAL MODEL AVIATION DAY, and we're also gonna bring out the CombatONEs a day of grilling speed controllers and grilling burgers. All planes welcome. Guests welcome (must show proof of AMA insurance). PLEASE REGISTER (IT'S FREE) SO WE KNOW HOW MUCH FOOD WE'LL NEED. We'll be barbecuing and driving through each other's streamers. Regular flying permitted all day. Combat will be performed in intervals so everyone can fly. WE WILL EAT AROUND NOON. CHESTERFIELD, Mo., Dec. 5, 2017 – Today, in celebration of the Boeing F/A-18 Hornet’s 40th Anniversary, the Spirit of St. Louis Air Show & STEM Expo announced the event would be held in both 2018 and 2019, with the US Navy Blue Angels headlining the 2019 event. The 2019 Spirit of St. Louis Air Show, scheduled for September 7-8, 2019, will be headlined by the US Navy Blue Angels in their made-in-Missouri Boeing F/A-18s. 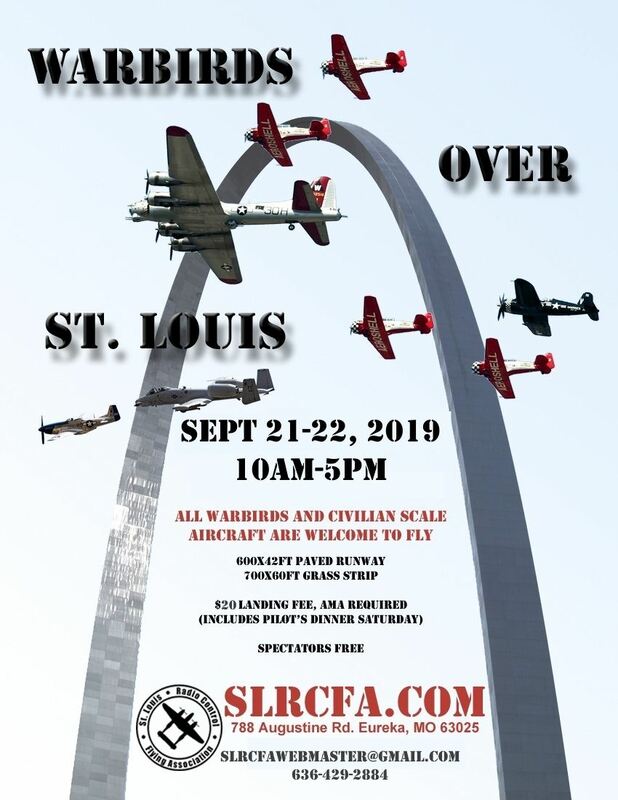 Both airshows will be held at the Spirit of St. Louis Airport. Previous air shows had been held there in 2014 and 2016. Additionally, in a change from previous years, all tickets will be sold online only. “The event will also feature our phenomenal STEM expo on the ground, and will continue to inspire our next generation of leaders to take science, technology, engineering and math to the next level – and beyond,” Bales said. Additional air show details will be announced in the coming months. For more information visit www.spirit-airshow.com. If you have a set of tools you can bring with you for the pavilion work, please bring along just in case. $20 landing fee includes pilots dinner. We're gonna get schooled on how to build flat EPP foamies (indoor or outdoor). Learn from the best how to get these together, keep them light, hinge them right, and make them last! Our resident EPP scratch-building foamie expert and 2018 co-winner of the Builder of the Year award, Bob Scheppele, will be leading the demonstration. 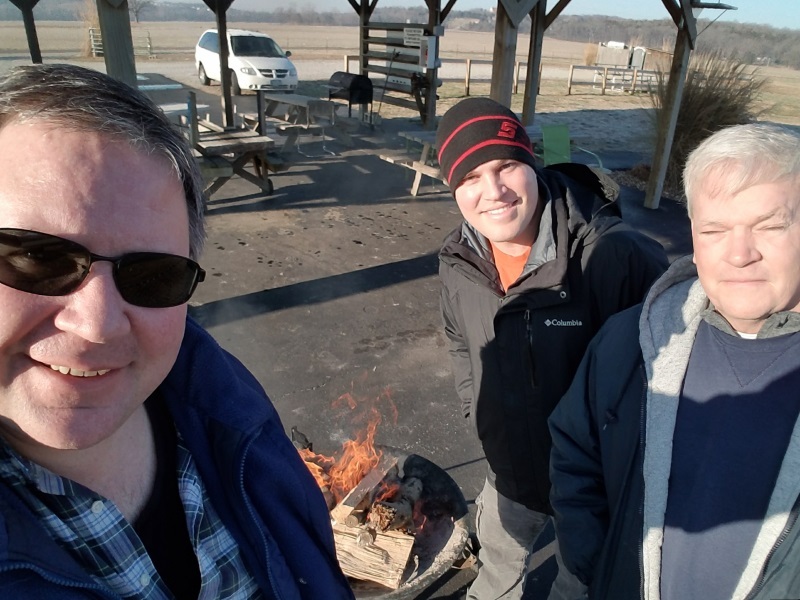 It' s time to break out the Toys for the Tots, the Toys for the Big Boys (rc planes) and the Chili. It's our annual Toys for Tots and Chili Fly. Non-SLRCFA members are welcome. Just need proof of AMA. Invite your friends! We'll eat around noon. Coffee and donuts will be served in the morning if you're there early. An in-package new toy valued at $20 or more as your landing fee. These will go to the US Marines present at the event for the kids. Bring your old planes, gear, magazines, whatever, as donations for our "Donate and Raffle" - 100% of the proceeds will also go the the Marine's Toys for Tots program. If you or your spouse "got game" - bring your best chili. If not, bring some chips, chili fixin's, a dessert, or beverages. Again, if you're not an SLRCFA member, bring your 2018 AMA card. 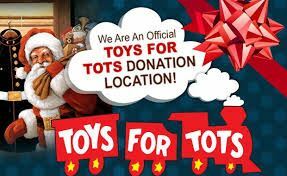 Optional: bring a checkbook or some cash to directly contribute to the Marine's Toys for Tots program. If you're not flying, come on down anyway and enjoy the fun! Has the weather been keeping you from flying? Just want something fun to do on a Friday night? It's exciting to give and get gifts, and we can get the ball rolling December 19th, 2019, from 6pm-9pm. Great $12 Catered Meal, with Beer, Soda and Water!!! We'll talk about our accomplishments in 2019 and our Vision for 2020. A big part of the night will be to make sure our QuickSTART members all get a chance to meet the "larger SLRCFA" membership. IMPORTANT REASON TO ATTEND: We will vote on the new board members! If you can't be there, we'll allow an electronic vote prior to the meeting. If you're a member, bring an old plane or that foamy you never fly... we'll give it to one of our QuickSTART members as part of the QuickSTART raffle. QuickSTART members: You'll be able to get tickets in the "QuickSTART Raffle" - no purchase necessary, but you must be at the meeting to paricipate. Additional tickets will be sold at the event, but only for QuickSTART and Youth members. Everyone attending the event will get raffle tickets. Raffle tickets will be sold at the event. We should have some seriously-nice prizes this year!!!! Everyone bring a wrapped gift valued at $20 for the gift exchange. Yes, we'll do the "Mean ole Santa" version. Some guys build foam airframes, which is cool for a gift, too. If you don't have a gift, come down anyway... you just won't participate in the exchange. If you have any questions, e-mail at SLRCFAwebmaster@gmail.com or call 636.429.2884. Thinking about joining? How about inviting a friend who's thinking about joining?! ...you'll be eligible for the gift exchange (if you brought a gift) and the member raffle. You're AMA membership will be validated later, as well as your payment, you can print your 2020 SLRCFA Membership card after logging into SLRCFA.com. FIRST FLIGHT - JAN 1 2020 - Happy New Year! It's a tradition, it's 2020, and we're flying on the first day of the year. Bring your plane out and we'll git to flyin at 9ish. We draw for first flight, then everybody get's in the air, if they dare. Members only for first flight drawing, but spectators and guests of members are welcome. 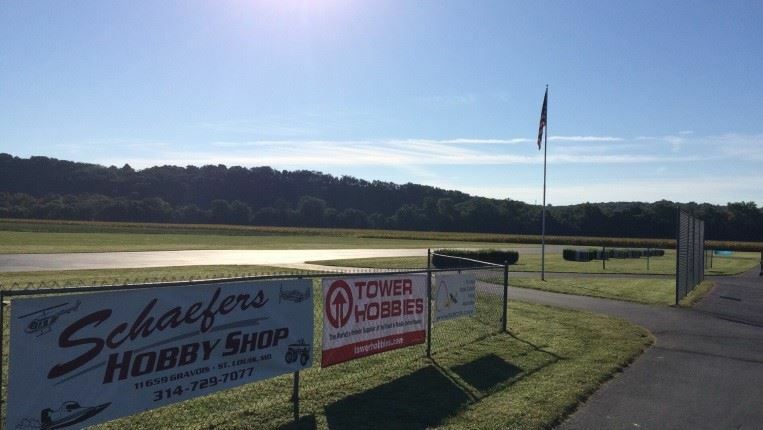 23 Apr 2019 CANCELLED - SLRCFA Club Meeting - April 2019 - CombatONE Night Fly! 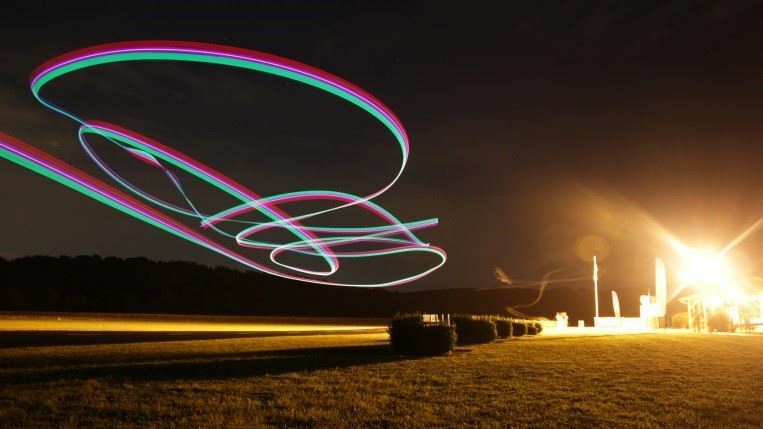 28 Jun 2018 SLRCFA Club Meeting, BBQ & NIGHT FLY! 01 Jan 2018 FIRST FLIGHT - JAN 1 2018 - Happy New Year! 21 Dec 2017 SLRCFA Club Meeting & Christmas Party! 13 Aug 2016 OPEN HOUSE! FLY FREE!! SPECTATORS WELCOME!! !